In 1977, the New York State Department of Commerce sought to turn the downward spiral of a increasing crime and a weaker economy. They wanted to develop a public relations advertising campaign that would be positive, memorable, and significant to forming a new brand for New York. They hired an advertising firm, Wells Rich Greene to develop the campaign. 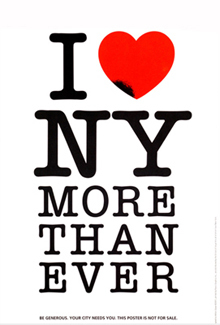 Research and surveys of visitors to the state confirmed that people really did have a love affair with New York. People loved the museums, shows, parks, historical sites, restaurants, and on and on. 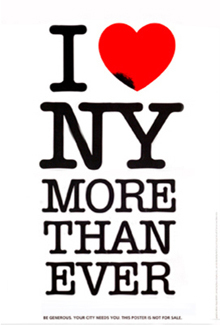 The common spoken answer, I love New York became the new tagline for the campaign. 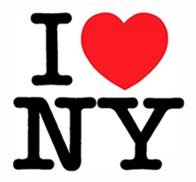 To develop the visual mark, the Department of Commerce hired Milton Glaser. Glaser designed a mark of stacked capsules containing the words I LOVE and NEW YORK. He presented it to the committee from Commerce and they liked it and accepted it for use. But, Glaser wasn't completely satisfied - his brain kept working on the problem and exploring solutions. He knew that design can always be made better. A few days later, Glaser was riding in a taxicab when another idea struck him - what about replacing the word LOVE with a symbol of a heart. It was not too familiar as a mark for the word but it was familiar for the concept of love as a result of Valentine's cards and Cupid. Then, he realized, if he could abbreviate LOVE with a symbol, he could take that further and abbreviate NEW YORK with the symbols N and Y. He sketched his idea and contacted the Secretary of the Department of Commerce the next morning. He told the commerce secretary that he came up with a much stronger visual mark for the new tagline. But, the secretary didn't want to reassemble the committee and go through the approval process again. Glaser insisted that he at least come by his office and just take a look. The secretary came by, took a look, grabbed the comp and left the office. The new mark sold itself and has since become one of the most recognizable and most copied icons our global culture. Immediately after the planes hit on the morning of 9/11, Glaser added the words MORE THAN EVER below the mark and put a small bruise on the bottom of the heart. He sent his quickly produced emotional expression to a friend at the New York Daily News who rushed the new visual image into the paper. The revised statement struck a nerve among New Yorkers and confirmed how much they loved their city. It became very popular, was posted around the city, and was reproduced as a poster. 1. The MORE THAN EVER lines are set centered, with uneven margins, rather than justified with even margins. 3. 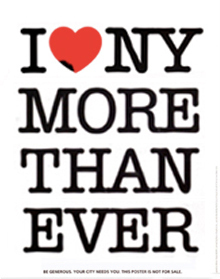 The visual weight of the MORE THAN EVER text is more substantial - to support the mass of I heart NY above it. 4. 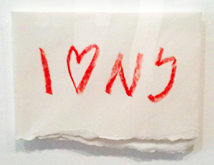 The tiny gap between the N and Y is tightened, unifying the characters representing the state. 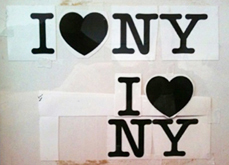 I wondered if the I ♥ NY type symbols could also be replaced with pictorial symbols, especially for the state of Texas, possibly the most recognizable shape of the 50. California, Alaska, and New York might be close seconds, but, the outline shape of Texas is universally known and recognized. There were others, but all were like these, with only the state letters replaced by an image and the 'I' still a letter character (except for the I Texas Texas one on the right.) I am surprised that the eye symbol hasn't found its way into the classic mark to replace the letter I, especially when a symbol or image is used for the other part (where the NY was originally). Using the eye symbol seems like a natural evolution of replacing words (like heart) with symbol images. I used a simplified Rand's eye symbol and rounded the sharp corners of the state shape to better relate to the other two symbols. It worked. The symbols clearly communicate and respect each other as a cohesive unit of 3 marks forming a strong statement. Then, I wondered about adapting the rendering to other states. Above right: I Love Colorado or I Love Wyoming or I Love Rectangles. This one would not work outside of those states - the state shape is just not unique enough to be quickly recognizable. The 3 states above (Delaware, Maryland, and New Jersey, but not necessarily in that order) may be a bit too obscure to be successful.